The Sheffield Carer Card has been developed to reward and recognise all the hard work you do as a carer. This card is for both young and adult carers. The Card offers discounts on a range of activities, products and services. It is the result of the generosity of local and national businesses who want to find a way to support carers and is part of our attempt to mobilise the city to work together to recognise the work carers do, help carers to connect with the services we offer and support a city-wide effort to make Sheffield much more carer-friendly. From Yoga to Butlins, cleaners to cafes, we’ve brought together an amazing range of offers. Please click on the categories on the left hand side of the page for full details. If you are on a mobile device click on the menu tab at the top left hand side of your screen. The reverse of the Card is designed to be used in case of an emergency situation. You may worry about what would happen if something unexpectedly stopped you from looking after the person you care for if, for example, you were involved in an accident or became ill. This card would alert others to the fact that you are an unpaid carer. It provides space for you to fill in details of two emergency contacts, who can support the person you care for. If you are incapacitated or involved in an emergency, the two contacts on the card can be called. They may be a friend, neighbour or relative. Talk to them before you put their name on this card. The card is now available to carers who are registered with Sheffield Carers Centre and as an incentive for people to register for the first time. The card is also available to Sheffield Young Carers. The card was launched at our AGM held on 30 November 2018. If you are not registered with the Carers Centre please complete our registration form and a welcome pack will be posted to you with your Carer Card. 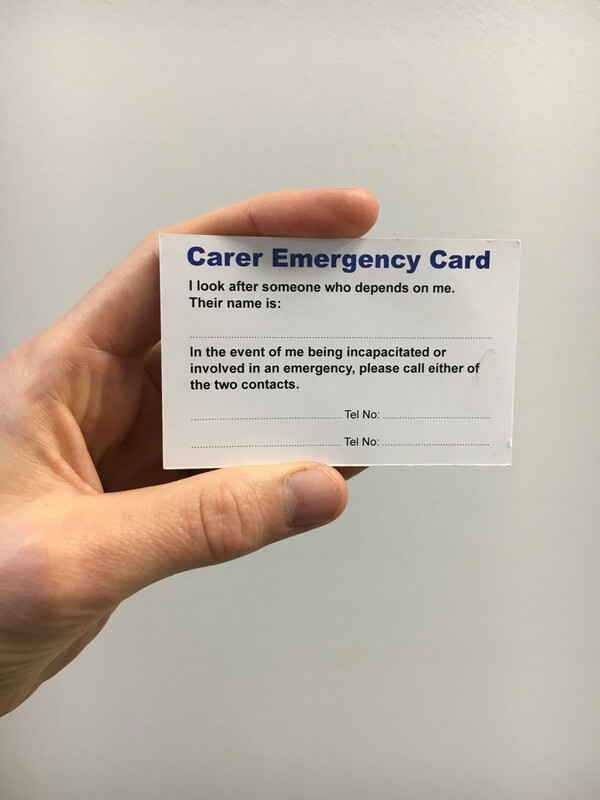 If you are already registered with the Carers Centre and would like to request a Carer Card, please email us: support@sheffieldcarers.org.uk or ring: 0114 278 8942. If you are a young carer and would like a Carer Card please contact Sheffield Young Carers on: 0114 258 4595. Please send me my Carer Card and register me with the Carers Centre (if I am not already registered). Please use this space to write a message if you wish. Please remember to include a way we can contact you (phone number or email) if you would like a reply. 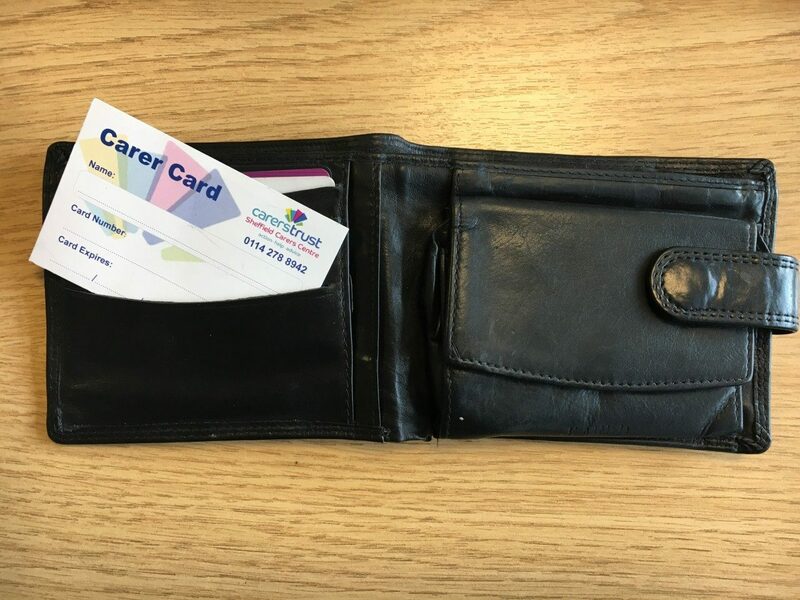 Alongside the Carer Card, carers can take advantage of other cards and offers provided by Disability Sheffield and and Carers Trust. The Access Card is a card like no other, Disability Sheffield translate your disability / impairment into symbols which highlight the barriers you face and the reasonable adjustments you might need. The Access Card is accepted as proof of disability and more at venues across the country. Find out more here.